They look elegant, feminine & contemporary- a winning combination! DON”T BUY UNDER PRESSURE, THE COST OF ME IS WAY LESS THAN A FASHION MISTAKE!! You cannot underestimate the importance of accessories when undergoing a wardrobe makeover service. 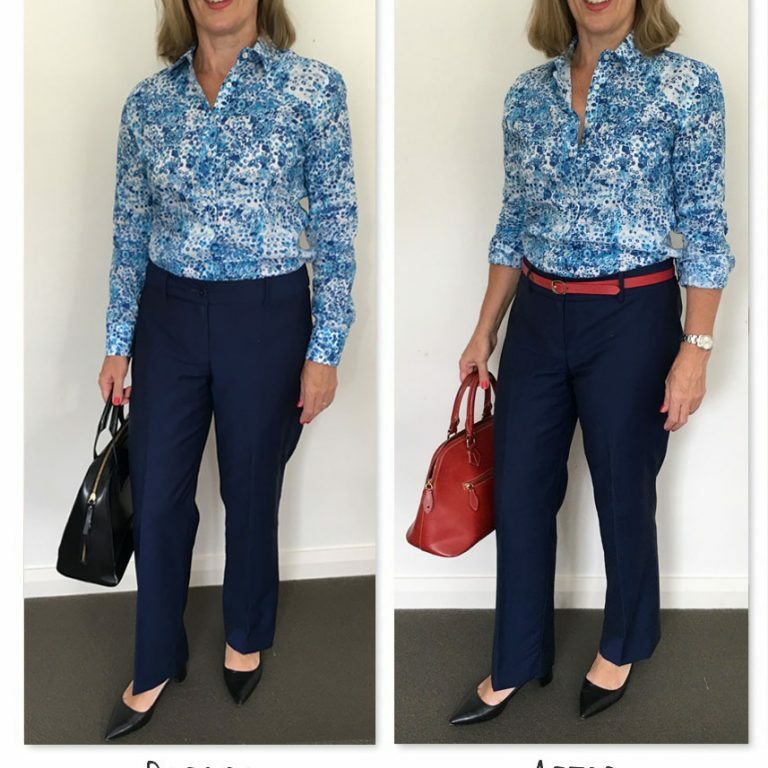 Showing clients how to accessorize is a key focus of my personal styling service (next to colour & body type) so what better way than to show you a before & after from an actual client! And the ‘BEFORE’ shows both of these. I also tweaked the shirt to look more relaxed and the style makeover results in a much stronger, modern & flattering outfit!! You also notice my clients lip & nail colour more as everything ties in. Simple! 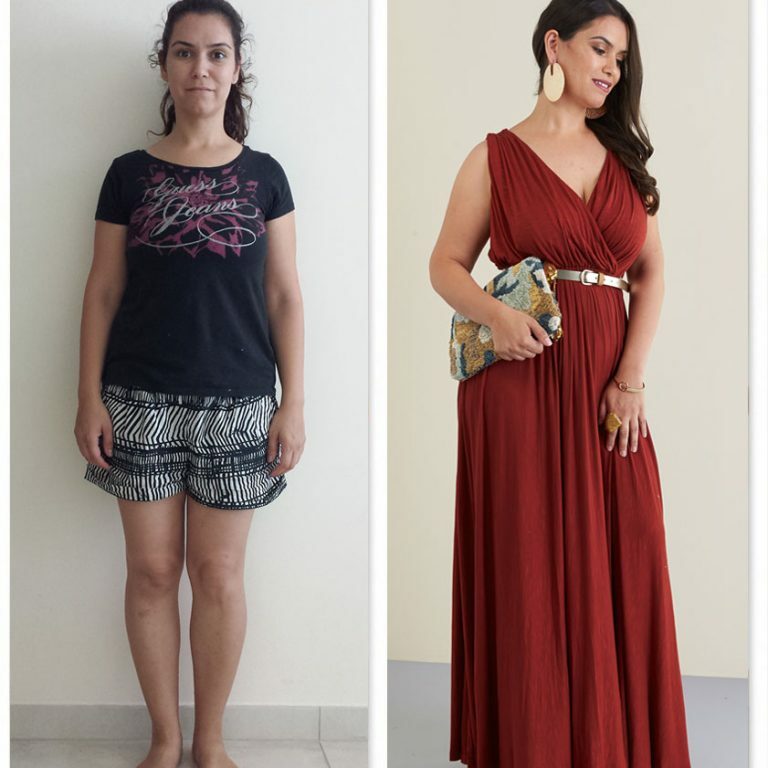 SMALL TWEAKS – BIG DIFFERENCE!! 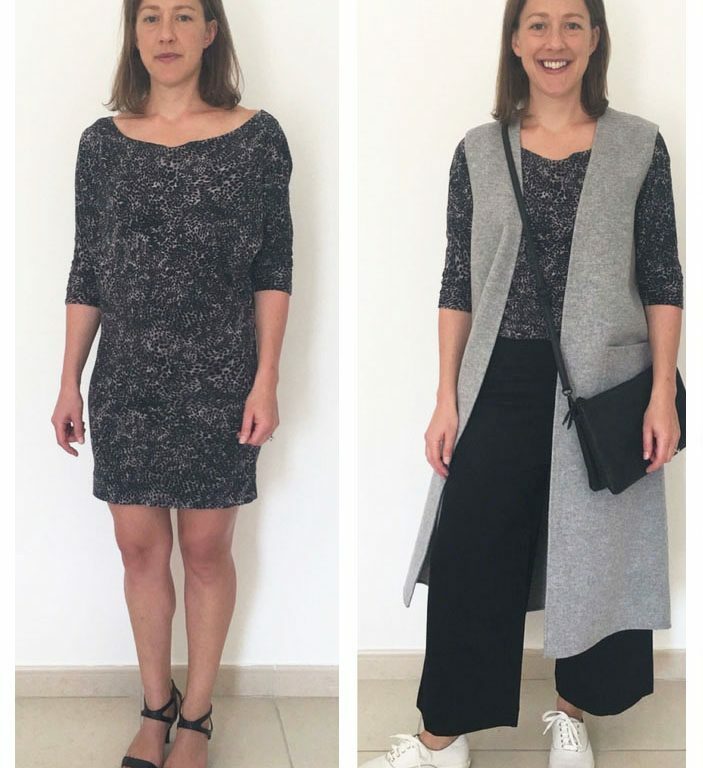 So many of my clients want to appear more ‘put together’ but are unsure how to do this without looking ‘corporate’. 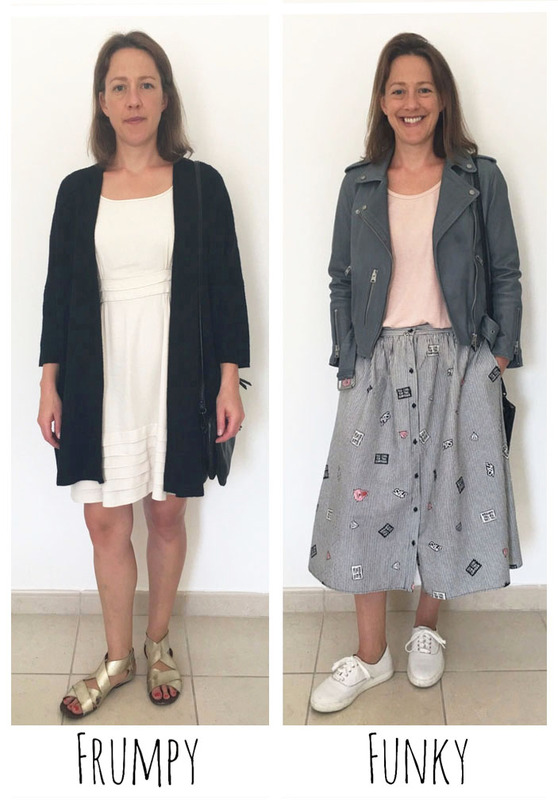 By simply swapping your cardigan to a jacket instantly elevates your look for an instant mummy makeover!! It creates a stronger silhouette with the metal work adding an edgier element. Keeping the colours soft avoids it looking like office wear which also helps to flatter Jen’s features as she has a softer overall look in her hair, skin & eyes. My client looks more contemporary yet still practical and playground appropriate. 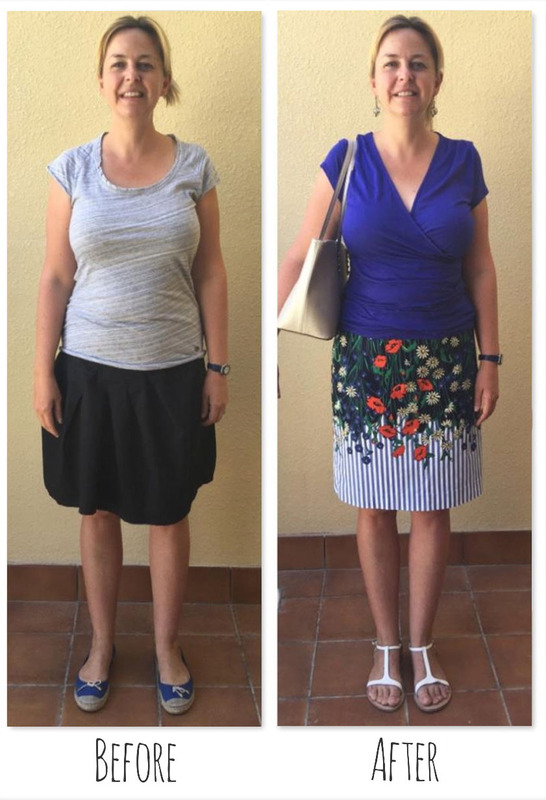 Amanda has a fantastic body shape but this outfit on the left makes her appear almost pear shaped. The neckline does nothing for her and the sleeve makes Amanda look like she has sloping shoulders. 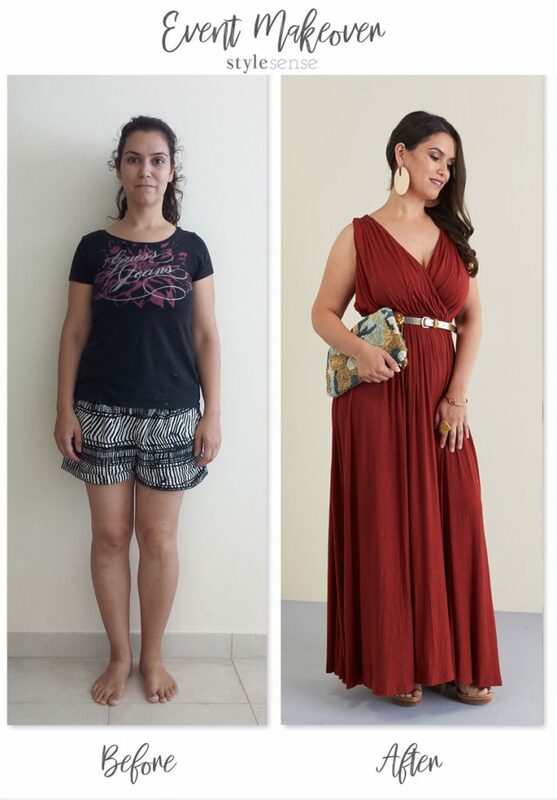 By changing the styles, giving her a stronger shoulder and a more fitted skirt, it instantly makes her look taller & slimmer! It completely transforms her body type by flattering her best features. Trudy felt stuck in a rut, felt mummsy and didn’t know what suited her body type. She needed a total image makeover. During session 1 I identified her most flattering silhouettes & she was amazed at how many she already owned! I also analysed Trudy’s colours and felt that her hair was too dark & stark for her which would be adding to the negative way she felt about herself. 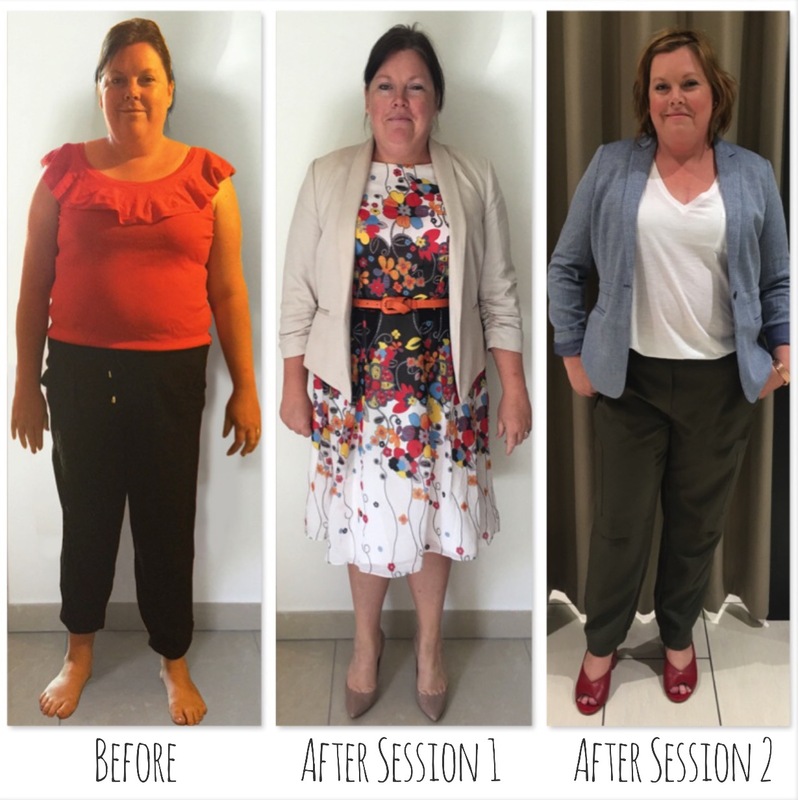 When we met for session 2, Trudy had softened her hair cut & colour, she was wearing her new outfits and was feeling great! 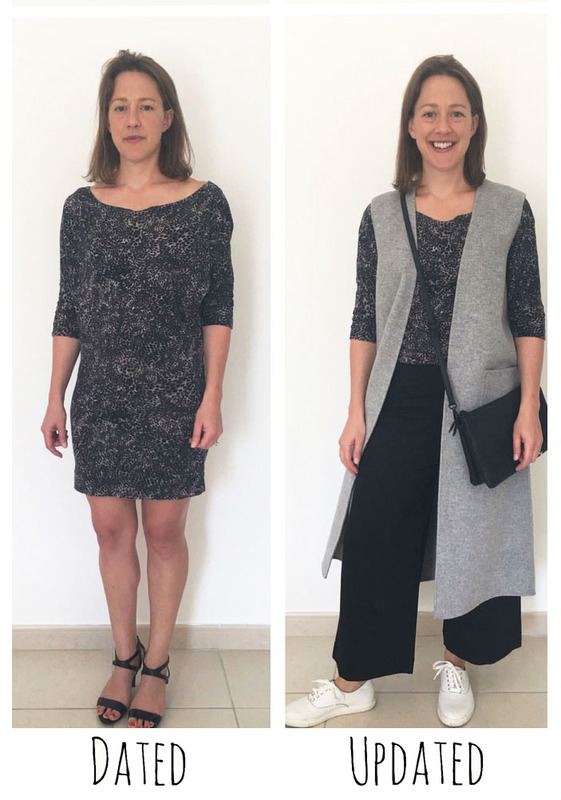 During our shopping session we added to her capsule wardrobe to offer more choice whilst experimenting with styles she had never considered. Trudy was a new person!! Clothes are never just about fashion. How you feel about what you see in the mirror every day is life changing. This is the gorgeous Lucy, who like many ladies with mousey hair, added blonde highlights. After several visits to the hairdressers, more and more blonde is put through the hair so it tends to loose depth. You can see the ‘before’ almost has a subtle green cast to it. Cue the bronde ‘after’ shade. AMAZING on Lucy! It brings back the depth of her natural hair colour but takes it to another level!! The new golden richness of her hair completely transforms Lucy’s complexion, enriching it and evening out her skin tone. Suddenly her eyes are sparkling and she looks younger and fresher. 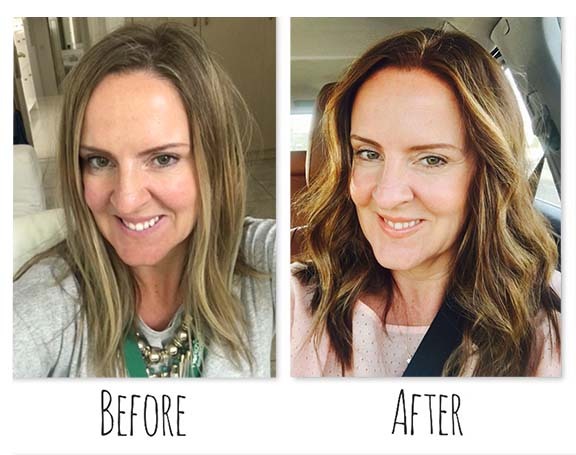 An incredible makeover simply by tweaking her hair tone. Even when you have a stunning figure with long, lean legs, different jean shapes can have a profound effect on how good your body type looks. This kick flare jean is stunning on Anjali and emphasises all her ‘best bits’ rather than the rejected jean shape that’s the wrong cut which makes her look bottom heavy. It’s amazing how these 2 different jean shapes on Anjali makes her body shape look like they belong to 2 different people!?! 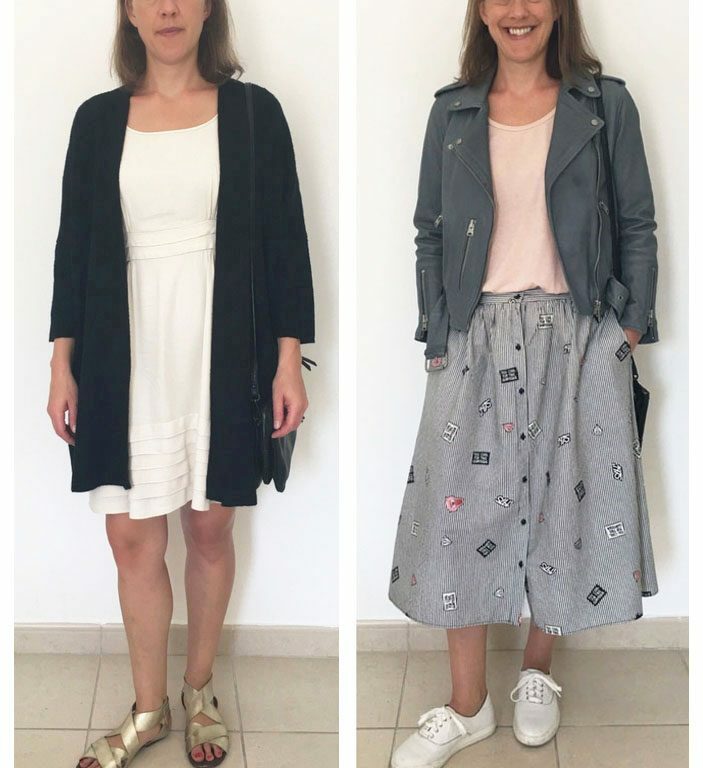 Emma in the 2nd photo has a straighter cut jean that sits over her shoe, elongating her leg. It’s a slicker update of the conventional ‘boot cut’ and flatters her shape as well as her cleaner personal style. 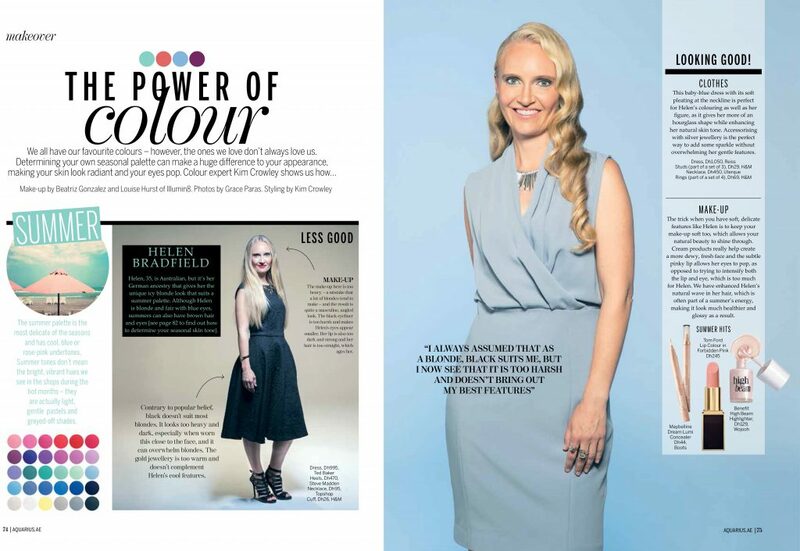 I produced this colour & beauty makeover photo shoot for a national magazine to prove that when you wear the right shades for your individual features, it makes you glow and can knock years off you! Helen has delicate colourings and looks completely overwhelmed wearing a heavy black dress with strong pink lip, her skin & hair appear completely washed out. 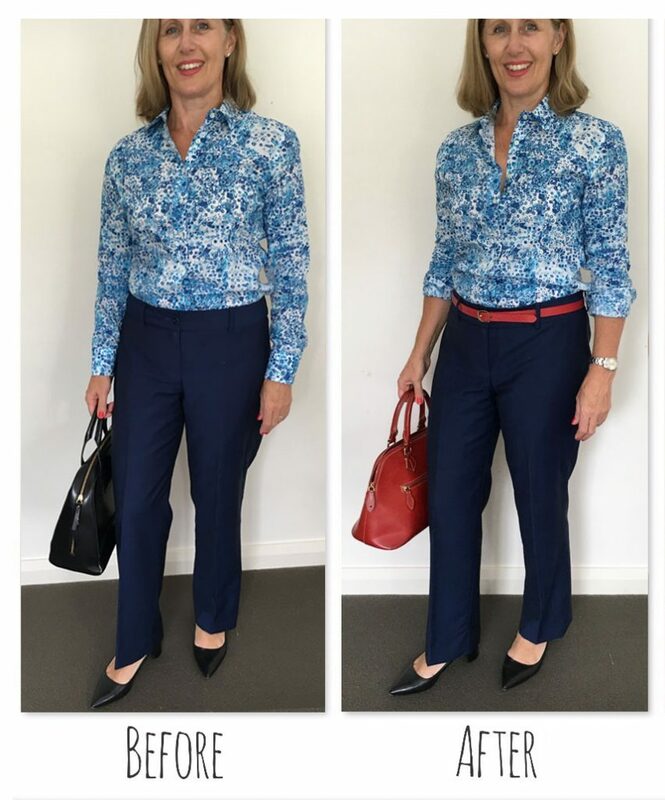 Many women make the mistake of wearing stronger hues hoping it will strengthen their features when in fact they completely take over and mask their natural colourings. Helen needs softer shades to flatter and by choosing paler clothes & make-up, her skin and hair now have a rich creaminess to them and her facial features are in harmony, allowing her to look like the natural beauty she is. Sometimes, all you need is a fresh pair of eyes to bring new life to an old favorite. 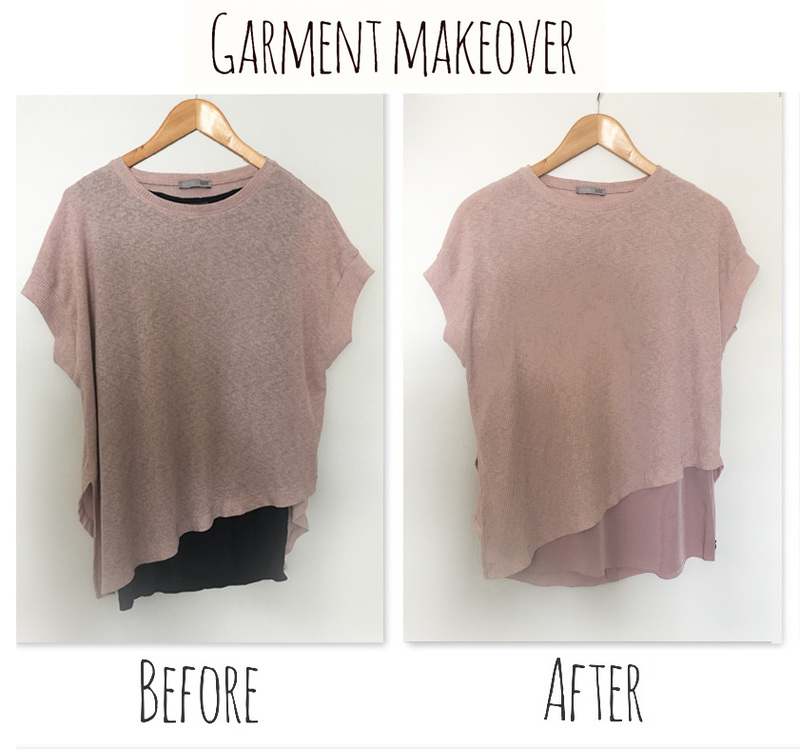 The dress was a classic piece but no longer served my client, so I gave it a garment makeover! 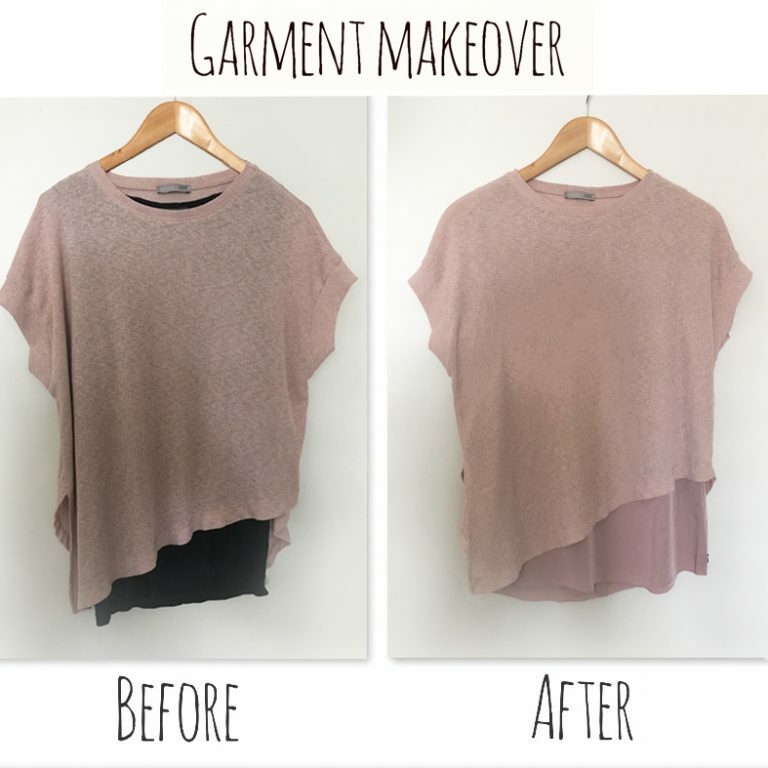 By changing the end use from a dress to a top breathes new life in to it – ideal for my client who lacked longer sleeve tops which avoided having to spend money on a new item as well! Jen now looks more sophisticated and it serves her lifestyle much better!